I saw these beautiful Mr and Mrs Pillows online the other day and thought I could do that, they would look lovely on our bed and I'd save a heap of money, so I did. 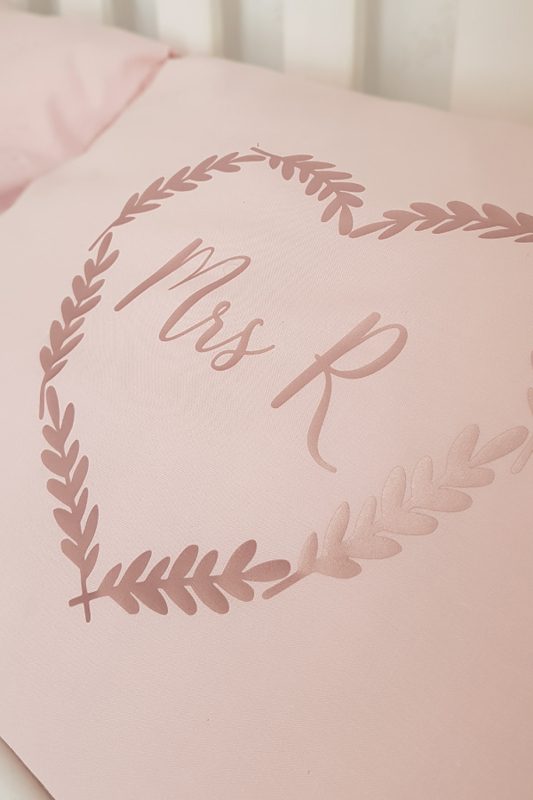 This is how you can make your very own Mr and Mrs or His and Hers Pillow Cases. As we are newlyweds what better way to celebrate with some DIY his and hers Mr. and Mrs. pillowcases. We have a Silhouette Cameo which I absolutely love but I never know what to do with it, I'm always looking for design ideas to try. We originally bought it to replace a larger cutter we had to make wall stickers and papercuts. 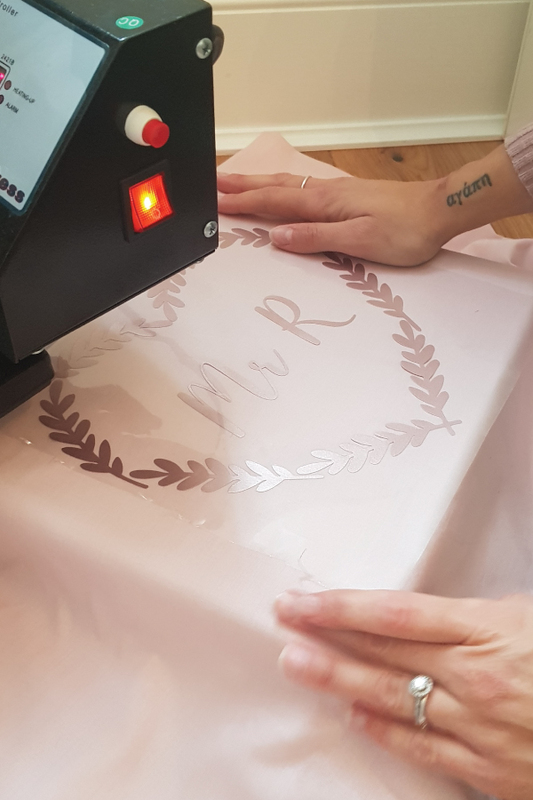 The Silhouette Cameo is so much better as it cuts cleaner than the larger cutter we had plus it takes up very little room, so I would definitely recommend it if you're crafty and like making things. The new Silhouette Cameo 3 is really nice! I really want one, we have the older model and it seems like a waste of money to upgrade when ours still works perfectly. They have the best prices on Amazon if you were interested. Luke's always trying to find little business ideas for me to take on. We both sell on Etsy and use the Silhouette Cameo regularly but the possibilities are endless. We've printed on t-shirts and bags but never pillow cases. Since the material is the same as t-shirts we knew it would be fine but we did worry that it might be uncomfortable to sleep on. Luke says you don't really feel it and if you do, you just use them as decoration and then flip them over to sleep on like I do, plus to be honest you wouldn't want to ruin them. I searched for some ideas on Pinterest and found a really cute design. I then made it my own with a few changes. I went over to fontsquirrel.com and Google images to get some similar fonts and images to use. I wanted to incorporate some pink into the bedroom as its very white at the moment. So I headed out and bought some cheap pink pillow cases to trial on. Luke has this really nice pearl flex t-shirt vinyl he uses on his t-shirt side hustle. Its pearl pink, it's beautiful so I borrowed some of that. The materials and Equipment you need for making vinyl printed Mr. and Mrs. pillowcases. To make these cute Mr. and Mrs. pillowcases set up all your equipment ready for printing. Open up silhouette on your computer and design your print. Whilst this prints turn on your heat press and get it up to temperature. The company who you bought the vinyl from should state what temperature to press at and whether it's a hot or cold peal. The vinyl we use is usually 150 or 60 degree Celsius and I like hot peel. Weed your print vinyl until you are left with your design. Our pillows needed ironing so we ironed them in the heat press. Then position your print in the middle of the pillow or wherever you want it placed. I saw some nice designs where the Mr. and Mrs. were in a corner. Place the pillow case in your heat press or a hard surface if ironing. Place the Teflon sheet over your design to create a barrier between the heat and the pillow before pressing. Press or iron for the time stated by your vinyl product spec. Once done remove the plastic film and check all the vinyl has fully adhered. Admire your cute new Mr. and Mrs. pillows. Note. For best results use a heat press like this one here. Ironing is difficult to get an even press and you never know if the pressure is correct. When we first started we used an iron and found the prints would always start to peel in the wash. Here's some images from our make and our end product. So cute.